Richa Chadha and Ali Faizal, co-stars of 2013 comedy flick ‘Fukrey’ are reportedly dating each other. Both the actors have also been seen going out on many occasion since the release of the film. 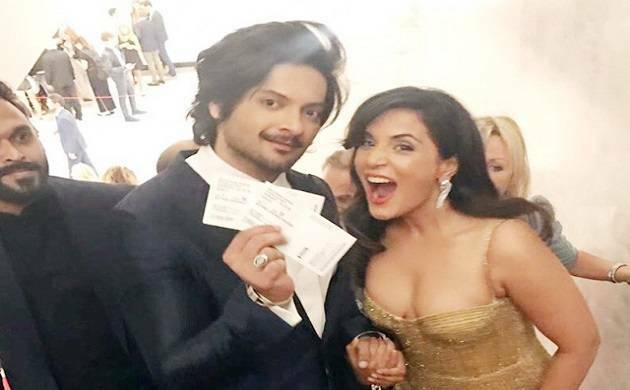 Richa Chadha and Ali Faizal, co-stars of 2013 comedy flick ‘Fukrey’ are reportedly dating each other. Both the actors have also been spotted at numerous ocassion since the release of the film. Recently, both Richa and Ali walked hand-in-hand at the Venice Film Festival where Faizal’s British-American film ‘Victoria and Abdul’ was to be screened. Revealing about their relationship, a source close to the actors said, "Richa and Ali have been friends for four years now and also have a common social circle. Their friendship turned into love only about a year ago. The transition happened gradually as they are like-minded people who share similar interests, be it films or their love for theatre’’. Some time back, Richa had admitted that If she meets the right person one day and fall in love with him, it will not bother her whatever he does for living. She won’t marry any businessman just like other actresses do. Richa, accompanying Ali on the red carpet also made the headline for her beautiful shimmering golden gown. She set many hearts on fire and made a bold statement in the gown with the perfect balance of glamour and sensuality. On the work front, both Richa Chadha and Ali Faizal are busy shooting for the second installment of the franchise ‘Fukrey 2’.